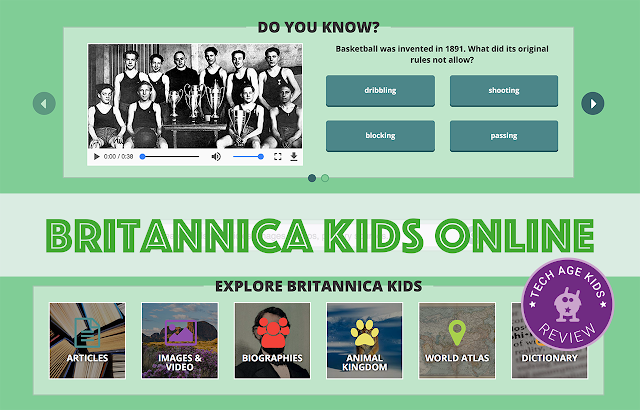 Britannica Kids is an online encyclopaedia packed with well-researched information on a variety of topics. The site has recently been released with full content requiring a subscription to access. I tried out Britannica Kids with my children who are in upper primary school. The content is designed for children from K-12 with differentiated content for different ages and abilities. Disclosure: We were provided with a free trial of Britannica Kids for the purposes of this review. As always our opinions are our own. The content is organised in three reading / age levels which is really useful. There's content for kids (primary/elementary), students (middle/high school) and scholars for young adult and adult learners. This is a nice feature and it's really easy to switch between the levels. Like a lot of kids, mine want to go much deeper into topics that really interest them. The content is well organised, and reliable, just what parents would want their kids to be using for homework and independent study. There is some use of images and video clips and a small amount of interactive content. However, it does feel rather dry compared to the kind of content that kids are used to. There are so many websites around packed with content that entertains and educates that a lot of kids might need convincing to spend time on such a low key site. Of course, those sites don't tend to have such high-quality information that is designed to meet the needs are specific age groups and abilities. My older son disappeared into Britannica Kids and really enjoyed researching topics. One of his interests is in wolves and he was soon quoting the results of research studies. "So how is this different to Wikipedia?" asked my son. He went off and compared and decided that the graphics, especially maps, were higher quality and he appreciated that he could access information at the student level which was 'just right'. Britannica Kids also includes a dictionary which is provided by Merriam-Webster. This isn't well integrated into the site and you can access similar content at Merriam-Webster's Word Central. There's also an interactive map feature, but it's just a small view of google maps with information about each country. In the US, the information is per state. We'd love to see deeper integration with the actual content. Britannica Kids is a great resource to have available for homework and in an educational context. It would be really valuable in a school or home education environment. It's also a high-quality resource for families, but you would need a plan for making sure you get the most from a paid subscription. Some kids will happily dive in and soak up the information, others will need some structure in place such as a specific time to check the daily highlighted content each day. My older son pored over the content like I would have devoured a paper encyclopedia at his age. The quality of the information is really high, and it's good to expose children to properly researched and credited content. Honestly, some kids will be happier on sites that have more focus on entertainment even if the quality isn't as high. While my younger son is just as information hungry, he's drawn to YouTube. Not as reliable, packed with advertising and needs constant supervision. But very much keeps his attention. It's a trade-off.